Photographer, High Street, Lewes. Edward Reeves founded the Lewes firm of photographers that bears his name in the late 1850s, and it has continued to flourish at the same address ever since. When Edward died in 1905, his son, Benjamin Reeves, took over the business, followed by his grandson, another Edward Reeves, and now his great grandson, Tom Reeves. There is good reason to believe that the Edward Reeves Studio is Britain's longest established photographic business. The founder, Edward Reeves, was born at Benenden in Kent in 1823 or 1824. His father, Edward Ayearst Reeves, was born in the mid 1790s, also at Benenden. In the 1820s or 1830s the family moved to Lewes, where Edward Ayearst became a grocer, first in North Street and then in the mid 1850s at 45 Cliffe High Street. As a young teenager in 1837 Edward Reeves was apprenticed to John Barnett (born in about 1800 or 1801), who was a watchmaker living at Number 184 in the High Street in Lewes. The 1841 census records that he was still serving his apprenticeship while living with the Barnett family at their High Street house. Having completed his apprenticeship, and perhaps having worked briefly as a journeyman, Reeves started his own business as a "master watchmaker" in 1845 at No. 68 in the High Street, on the south side near the junction with Watergate Lane. In April 1851 he married Eliza Holman from East Hoathly at St Michael's Church, Lewes. She was five years his senior, and the daughter of a farmer, John Holman. The couple had two daughters: Ellen Alice Reeves, who was born in 1855, and Mary Elizabeth Reeves, born in 1858, both at Lewes. In 1855, Eliza was recorded as working as a milliner. On his marriage certificate Reeves described himself as both a watchmaker and a jeweller. According to Fiona Marsden ("The Reeves Collection of photographs held by the Sussex Archaeological Society", December 1882, Sussex Archaeological Society Newsletter, 38, 299-301), it was following a burglary at his shop in 1854 that he became interested in photography, presumably because he considered photographs and cameras would be less inviting to thieves than jewellery. Over the next few years, he set about acquiring the necessary skills to undertake commercial work. However, his premises on the High Street proved unsuitable for constructing a photographic studio (they faced south at the back, into the sun, and were over the railway tunnel and thus subject to vibration). He and his family therefore moved to No. 159 on the north side of the High Street, next to St Michael's Church. With advice from John Russell, a London photographer, Reeves constructed a photographic studio in his back garden, with a northerly roof-light and large, east-facing glass windows so that shadowing would be minimal. According to the firm's ledgers, he opened for business as a commercial photographer in 1858, taking mainly portrait pictures. That he did not immediately abandon his original trade of watch making is shown by the 1861 census, which describes him as both a "watchmaker and photographic artist". Edward Reeves displayed enviable technical and aesthetic skills as a photographer, and was soon able to build up a thriving business. However, in 1871 he had to come to terms with the death of his wife Eliza, and in 1874 more misfortune followed with the death of his elder daughter Ellen. He embarked on a second marriage at the Jireh Chapel in Lewes on May 22, 1873. His new wife was Charlotte Ballard, who had been born at Margate in Kent in about 1834. She had been living in Southover, Lewes and was the daughter of John Sheather, a farmer. She bore Edward a son, Benjamin Vinall Reeves, in 1874. By 1881 Edward Reeves had so much trade that he had to employ "one man and two female assistants", one of whom was his daughter Mary, who was a "photo shop assistant". Each year, he took about 700 portrait photographs of people living in and around Lewes, including local gentry, as well as views of the town and its surroundings. Edward Reeves was still very much in charge of his business at the age of 77, when the 1901 census was held, but by this stage he was employing his son Benjamin and daughter-in-law Gertrude as fellow "photographers". Gertrude, who had been born at Mudford in Somerset in about 1872, had married Benjamin in 1900. The couple had their own sitting room and bedroom on the second floor. 1) Two (possibly more) real photographic cards show firemen on the morning of October 4, 1904 hosing down the still smouldering remains of Dusart's pair of shops across the High Street just west of the Reeves Studio. 2) The Studio also issued a card entitled "Lewes Castle", impressed with dark ink "E.Reeves. Copyright". A May 21, 1904 postmark has been seen. A card of the Barbican at Lewes is similarly impressed, but no postmarks have been found. 3) Edward Reeves' historic panorama of Lewes from Cliffe Hill of c. 1869 (reproduced by Brent and Rector: Victorian Lewes, plate 2) was also sold as a postcard, but without any indication of the publisher. A June 1904 postmark has been seen, so the card may actually have been issued by Edward and not Benjamin Reeves. 4) A fine view of Lewes from Race Hill with sheep in the foreground was also issued anonymously. A June 1905 postmark has been found. The Photochrom Co. of Tunbridge Wells used the same photograph for one of their own cards (Number 49256) in the 1920s. Presumably the Reeves Studio supplied them with a copy negative. 5) In August 1906 Benjamin Reeves photographed Army staff building a temporary bridge across the Ouse near Rodmell.At least three contemporary postcards are known. One is marked "Reeves. Copyright"; the other two are anonymous. Probably issued at the same time is an untitled study of a group of officers at an unidentified location that is stamped in ink "Reeves. Copyright". 6) Another early card showing "Lewes from Coombe" was initialled E.R. on the photograph, but not marked "Copyright". A November 1905 postmark has been found. The photograph was taken in the summer of 1885, 1886 or 1887. 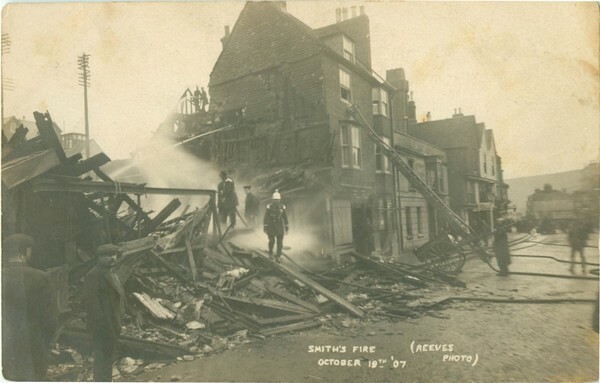 7) In 1907 the Studio issued at least three cards of "Smith's Fire", another great conflagration in Lewes High Street that broke out on October 19, 1907 in a shop next to Barbican House. 8) A publicity card issued by "E. Reeves, Photographer", showing a dinner in the Town Hall, posted to participants in June 1908 offered 12 by 10 inch prints at 3/9 each! Much later in age are some sepia tinted cards marked "Reeves" that show the smouldering remains of the Bear Hotel by the river in Lewes - the hotel burnt down in 1918. While some of the cards that Benjamin Reeves published survive in excellent condition, many have become blackened with age and have developed a sooty, somewhat reflective "bloom". The problem is not confined to cards of a particular month or even year, and so cannot be due to an isolated mistake during development. The affected cards have the same printed backs as some equally defective cards produced by Douglas Miller of Haywards Heath at around the same date. It seems likely therefore that the manufacturer of the photographic card was to blame and not the unfortunate photographers who selected it. It is not known why the Reeves Studio went to the trouble of marking some cards as "Copyright", yet issued other cards entirely anonymously.